Home blogging blogging hobby deriviation devices electronics device gadgets gizmos History of the Blogs rocky's blogs Tech Guide techkyrocky technology technology blog History of the Blogs Chapter 7: "Going Techie with TECHkyrocky"
History of the Blogs Chapter 7: "Going Techie with TECHkyrocky"
You already enjoy discovering each bits of rocks, listen to your favorite music and watch its music video, read my literary articles, and get to know everything about your favorite TV series! Now it's time to become techie! We're already on the seventh chapter of the history of my blogs. So for this part, let us know the history of this gadget and gizmo techie site known as TECHkyrocky! Originally, this site is known as Mortgage Plus, a real state blog site all intends for commercial purposes. It just aims to get ads and attracts clients. Until I decided to reformat and convert it! Friday, May 8, 2009 the former Mortgage Plus site was converted to what is known now as TECHkyrocky. The layout, the design, and of course the contents were all changed. The previous real state articles were all deleted and changed to articles about gadgets, gizmos, devices, and all the techie things and products! 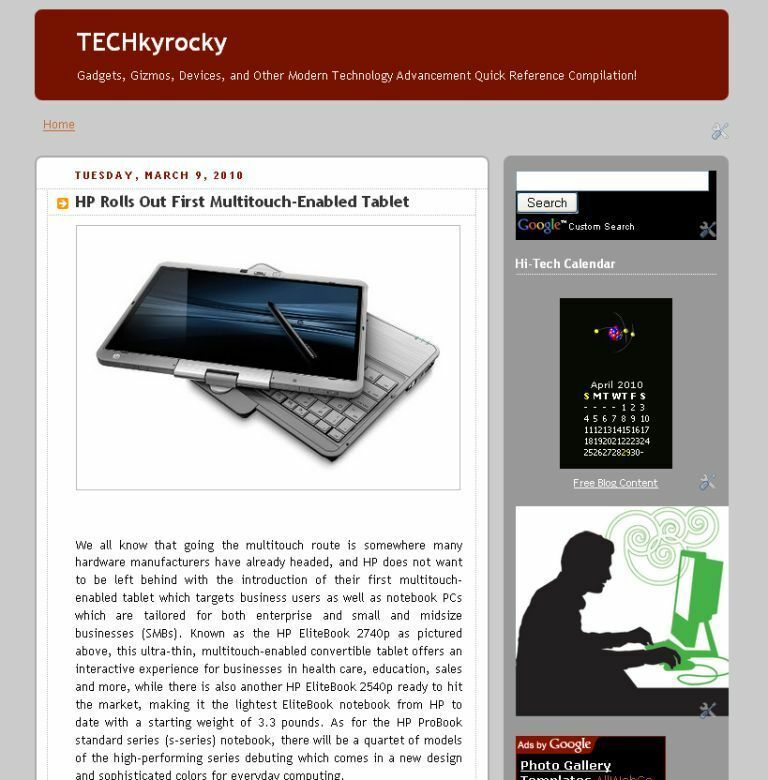 The reconverted site was now renamed as TECHkyrocky. Again, it came from two words: "tech" and "rocky". Forming them together means "a techie rocky". Merging them forms "TECHkyrocky". But why TECHkyrocky and not as Techierocky? Well, it's simply because to make it coherent with my name rocky. If I use Techierocky, my name should be Rockie leading to a title Techierockie! So since I am Rocky, and to put coherence and parallelism to my blog title, it was named as TECH-ky-rocky, the word TECH was merge by ky to rocky giving you TECHkyrocky! Take note that the first word TECH was capitalized to emphasize that this is a tech or a techie blog! It is then followed by the small caps kyrocky! 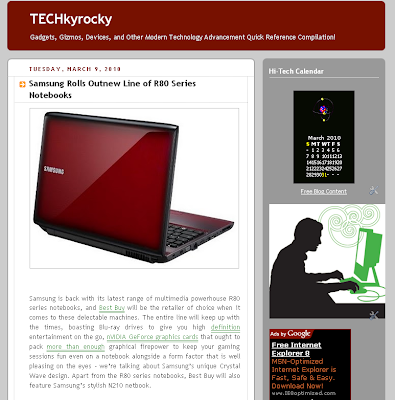 Of course the URL was also patterned to its name giving you the address as techkyrocky.blogspot.com! The site's subtitle description is "Gadgets, Gizmos, Devices, and Other Modern Technology Advancement Quick Reference Compilation"! since all of its contents all came from the different web source! Yup, it contains no original articles since it's only a compilation of all the tech articles around the net! It aims to provide the readers with the latest gadgets, devices, or technologies. Since each devices have their own specific specs, better to just borrow the exact articles from its original source rather to make my own to avoid an interpretation mistake!